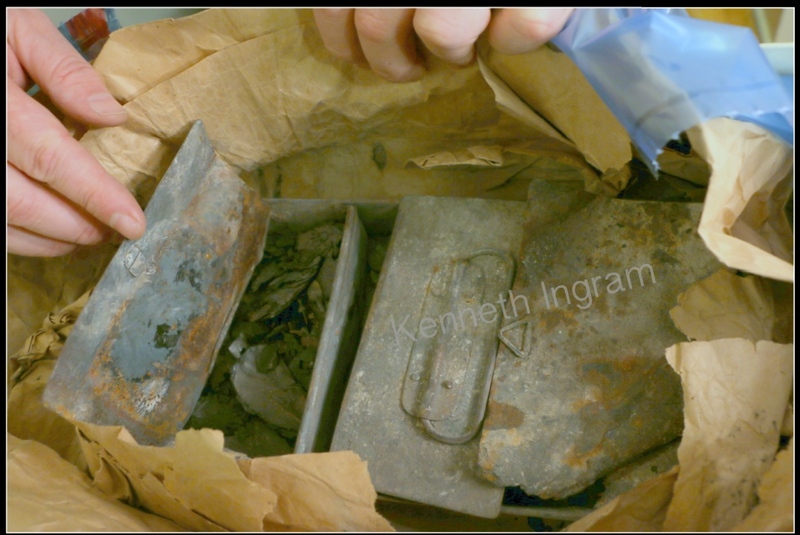 Lifting a thin metal flap, Patrick Murphy carefully reveals scorched papers inside a mangled mailbox that he recently discovered in the attic of his family’s north-end home in Halifax. Wrapped in crinkled brown paper and neatly tied with string, the mailbox had been stored in his grandfather’s old trunk and contains letters that were delivered nearly 100 years ago but never read. Patrick Murphy displays the mailbox that he found in his grandfather’s old trunk. “It’s probably something that my grandfather, Walter Murphy (Sr.), found in the rubble when he came back,” he says. Walter Murphy Sr. was a travelling salesman in Newfoundland at the time of the Halifax Explosion and returned to Halifax when word of the disaster spread. “When he came back, his two brothers had been killed on Duffus Street. Their families and children were killed,” says Murphy, explaining that his grandfather’s wife and eldest son were in the hospital at the time. Patrick Murphy found the mailbox a few months ago in a house that was formerly occupied by his aunt, Mary Murphy, who died last year at the age of 98 and was one of the last survivors of the Halifax Explosion. Murphy, who doesn’t remember her mentioning the mailbox, plans to donate it to a local museum. Others also continue to come forward with artifacts from the Explosion. Ray Doucette and Catherine Ross live on the property where the home of Vincent Coleman once stood. Coleman, a dispatcher with the Canadian Government Railway on the harbourfront, stayed behind as his building was evacuated and sent a Morse code message warning of the coming blast. While digging in their backyard, Ross discovered a variety of items that she willingly shares with others, including twisted forks and melted globs of glass. They’re kept in a small box along with things that neighbours bring from their backyards. Dan Conlin, the former curator of the Maritime Museum of the Atlantic, has 19 years of experience at the museum and offers a greater context for these artifacts. “We were contacted about six to 10 times a year by people who had Explosion objects,” he says, explaining that the most common are fragments of the SS Mont Blanc that landed all over the north end of Halifax, Dartmouth and the Bedford Basin. According to Conlin, fragments tend to be more concentrated in some areas of the municipality than others. The museum has analyzed about 200 metal fragments, and roughly 50 of them are held by the Maritime Museum of the Atlantic. He says that based on their research, the Mont Blanc likely disintegrated into several hundred thousand pieces and the fragments at the museum represent merely 0.04 per cent of the vessel. Other relics of the explosion include photographs, furniture and clothes, as well as Vincent Coleman’s timepiece, his wallet (containing a raffle ticket) and the telegraph key he was using when he was killed by the blast. But less known is an unusual coin collection that was donated last year and is not currently on display. In 2013, Joel Zemel was working on a book about the Halifax Explosion, called Scapegoat, and had hired a mason, Stephen Innocente, to fix the top of his chimney. While learning about Zemel’s book, Innocente brought forward a sentimental keepsake that had been passed down from his step-grandfather: a stack of pennies that had been fused together by the heat of the explosion. “He found them in the streets during one of his milk deliveries up by the Hydrostone somewheres,” Innocente explains, recalling that his late step-grandfather, Tom Rodgers, had used the milk wagon to help transport injured people to the hospital. “I was very attached to (the coins) because I was very close to my grandfather,” Innocente says, noting that the decision to donate them wasn’t easy because the only other memento of his grandfather is an old hockey picture. According to Lynn Marie Richard, assistant curator at the Maritime Museum of the Atlantic, the coins were temporarily on display but have been moved into storage with other artifacts as renovations at the museum are underway. “We can’t accept everything,” she says, explaining that items are considered based on criteria such as whether they fit with the museum’s mandate. “An artifact is an object that has a powerful story behind it,” says Conlin. “I know somebody who still carries around a dollar bill that was carried by their grandfather who was killed in the explosion. The magnitude of the explosion and the lasting impression of these artifacts are also highlighted by Zemel.